Everybody dreams of winning the lottery, of never having to worry about money ever again, but what many don’t know is winning the lottery can come with a dark side. It’s not all just mansions and private jets, there are plenty of lotto winners who have fallen into debt, divorce and despair. Take a look at these horror stories of the not-so-lucky lottery winners, whose jackpot wins ultimately ruined their lives. 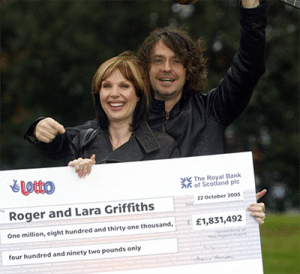 Lara and Roger Griffiths were a happy couple who supposedly had a dream marriage – until they won the £1.8 million jackpot in a UK lottery in 2005. The couple used their winnings to buy all the trappings – a dream property in Yorkshire, a Porsche, a Lexus 4X4, designer clothing, overseas holidays and private school educations for their two daughters. You could say they were living the dream, and at one point the interest on their lottery win alone was earning them £340 a day. William ‘Bud’ Post won a whopping $16.2 million jackpot in a Pennsylvania lottery back in 1988, but his lottery win was life changing for all the wrong reasons. He was destitute when he purchased the winning ticket, pawning a ring for $40 and using the money to buy 40 lottery tickets, amongst which was the winner. But within a year he’d lost it all, and worse still, was a million dollars in debt. Bud spent his winnings on a mansion in Oil City, a twin engine plane, a sailboat, a luxury camper, several cars and motorcycles, a Florida restaurant for his brother and sister and a used car lot for another brother. Then a former girlfriend/landlady successfully sued him for a third of his winnings, claiming they’d made a verbal agreement to split any lottery winnings, and Bud couldn’t afford to pay her. To add insult to injury, one of his brothers was arrested for hiring a hit man to kill Bud in the hopes he’d land an inheritance. In a 1993 interview, Bud said, “Everybody dreams of winning money, but nobody realises the nightmares which come out of the woodwork, or the problems.” And boy was he right! He was eventually arrested on an assault charge for firing a gun at a debt collector, and after being released from prison was reportedly living on $450 a month in disability welfare. Bud died in 2006 from respiratory failure, with six divorces under his belt. 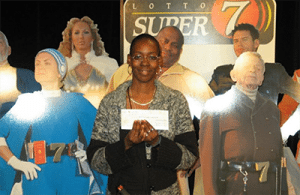 Evelyn Adams defied all odds when she won the lottery not once, but twice, taking out jackpots in the 1985 and 1986 New Jersey lotteries. All up, she fell into about $5.4 million in winnings. But even the strongest strain of luck can’t buy good financial skills, and it didn’t take long for Evelyn to burn through her millions. She blew her lottery win on lavish shopping sprees and a problem gambling habit seeing most of her winnings go back into the Atlantic City casino system. Evelyn has reportedly now lost everything and currently lives in a trailer park. Sharon Tirabassi, a single mother of three, thought luck was finally on her side when she won $10.4 million in a Canadian state lottery in 2004. She was on welfare at the time, having grown up in a poor family and spending her youth moving from shelter to shelter. Excited about the prospects of a wealthy new lifestyle, Sharon used her winnings on all the lavish luxuries she had never been able to afford. Millions was spent on houses, four luxury cars including a Hummer, a Mustang, a Dodge Charger and a Cadillac Escalade, and all-expenses paid trips for her and her friends to Mexico, Florida, Vegas, California and the Caribbean. Jeffrey Dampier and his wife won close to US$20 million in an Illinois state lottery in 1996, and when they divorced and split the winnings 50/50, he decided to be smart about his money. Jeffrey remarried a woman named Crystal Jackson and the two moved to Florida where he invested his winnings in a gourmet popcorn business called Kassie’s Gourmet Popcorn. All would have been well, except Jeffrey was also supporting Crystal’s two sisters, Victoria and Terri, while having a secret affair with Victoria on the side. In 2005, Victoria and her boyfriend Nathaniel Jackson made a plan to murder Jeffrey and take his money, a plan which obviously turned bad for all involved. Jeffrey was shot in the back of the head and killed, and Victoria and Nathaniel were both sentenced to life in prison, proving the very sinister side of lottery wins.